N.E.W.T. exams are just around the corner at Hogwarts School of Witchcraft and Wizardry and Albus Severus is staying up late studying! 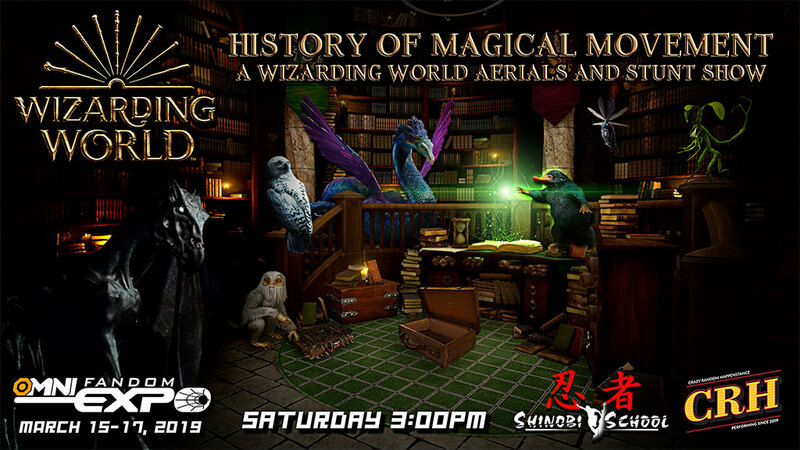 Join him and his friends in the Great Hall for a retelling of the History of Magical Movement throughout the Wizarding World. CRH (Crazy Random Happenstance) is a spirited young group that love everything related to shadowcasting. We have shadowcasted Dr. Horrible's Sing-A-Long Blog, Clue, The Princess Bride, The Room, Beetlejuice, and Buffy the Vampire Slayer: Once More with Feeling. We have also performed a variety of small interactive events themed around Doctor Who and Sherlock. Once again, CRH will be teaming with Shinobi School to bring you a show of what they can really do and bring other fun surprises along the way! Shinobi School: Your premiere ninja academy for: Parkour, Circus & Aerial Arts, Movement, Choreography, Entertainment, and American Ninja Warrior training in the Tampa Bay Area. At Shinobi School we firmly believe that athletic skill, combined with courage and altruism, will help our students make themselves and the world around them a better place to live in. With training, learn to safely and efficiently help yourself and others overcome obstacles in your environment by embracing the idea of “Be strong to be useful”.